This is a brewpub set in the beautiful countryside of the New Forest surrounded by trees and wild horses. It is a Wadworth pub, but they allow it to brew two of its own beers, which you can see from the corridor leading to the toilets (yes I know, they are always by the toilet - is this a coincidence?). The beers are Forest Gold and Tom's Tipple. The other beers are Wadworth's Farmers Glory, 6X and IPA. The house brewed beers are wonderful, well kept and they are not shoved through a tight sparkler - makes a change. The inside of the pub is all wood and has many different areas surrounding a central bar, not all accessible by the disabled, but enough to have a good night out. Tables are all of the farmhouse kitchen variety with a mixture of high backed carvers and other styles on wooden floors. Everything reeks of the country, including the pictures on the walls. Food is served both lunch and evening and there is a separate eating area on the far side of the pub where children can sit and eat. The food is traditional pub food, though the portions are big and welcoming. They also do specials that are more exotic. Prices can be a little high in places, but the warmth of the atmosphere and the real ale make up for it. A well known haunt of those having an affair, so plenty of cosy corners and there is no music either. Alas no accommodation either (though you can camp) and it is miles from anywhere. Beer festivals held twice yearly, October and March. Dogs are also welcome. Bikers are also welcome as can be seen from the picture. 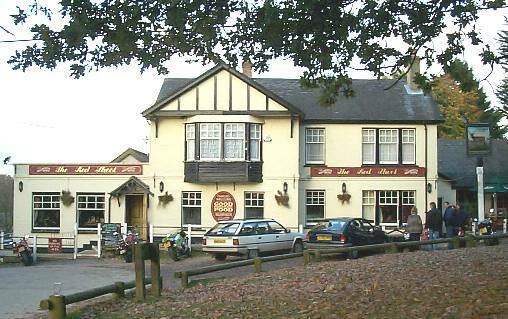 The brewer and landlord is soon to leave (October 2003), but brewing will still take place on site under new control.